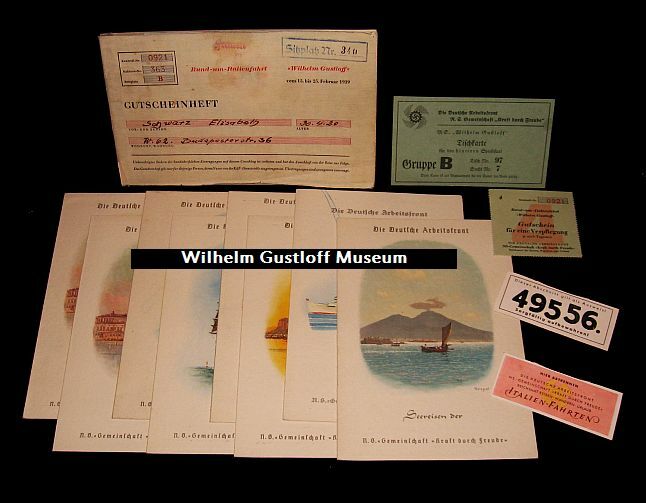 Ticket Booklets from the Wilhelm Gustloff - Italian Cruise. Passenger Hildegard Zirgiebel, Kontroll-Nr. 0758, Kabinen-Nr. 5, Bettplatz B (Left). Passenger Kathi Nanimann, Kontroll-Nr. 0167, Kabinen-Nr. 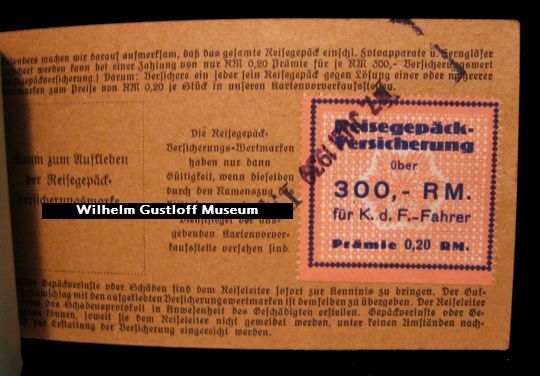 222, Bettplatz B (Below). 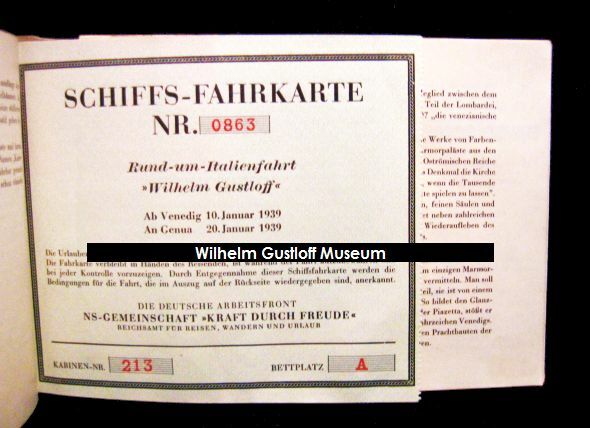 - The ticket booklet to the left is the later format for the voyages on the Wilhelm Gustloff. 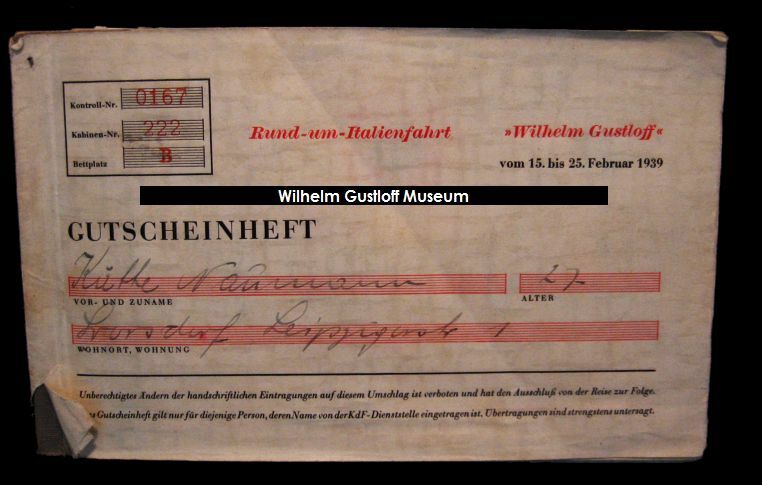 - The yellow ticket at right is the new format for the boarding tickets for the ship. 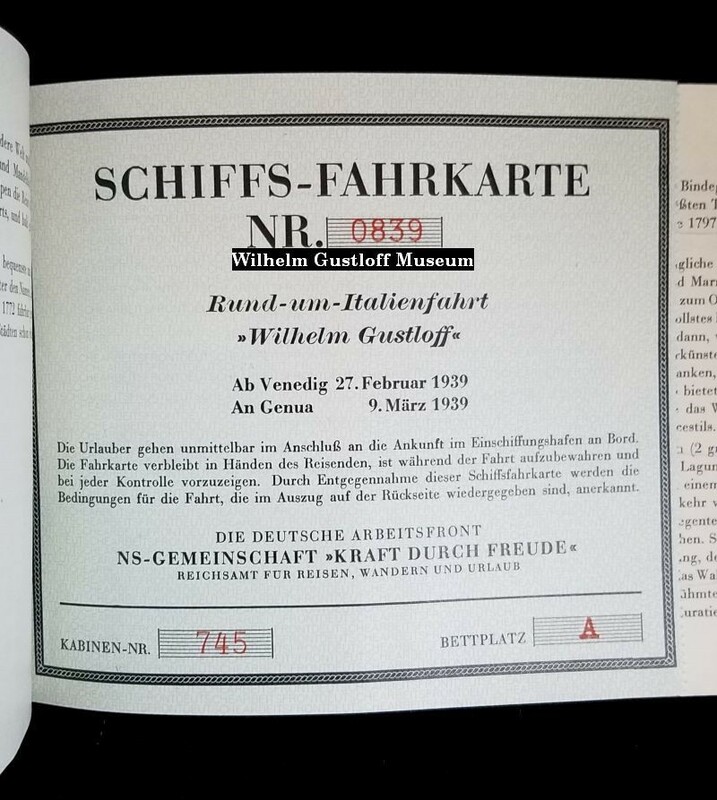 The next two pages are information pertaining to the voyage and the last is the back cover of the booklet. 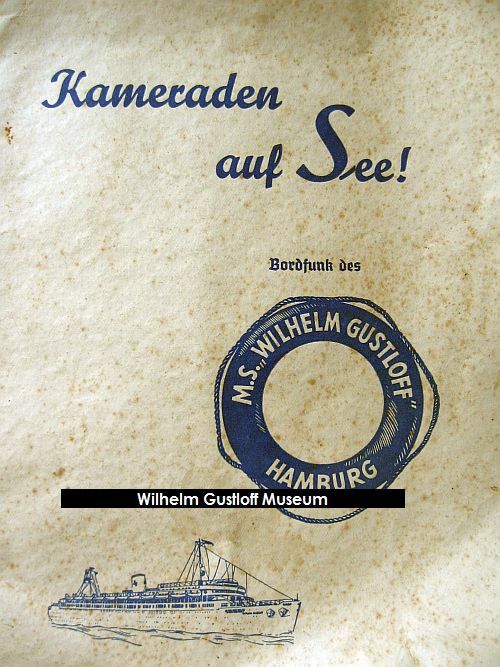 It has a map of the city of Hamburg, and several pictures of KdF liners and scenery. 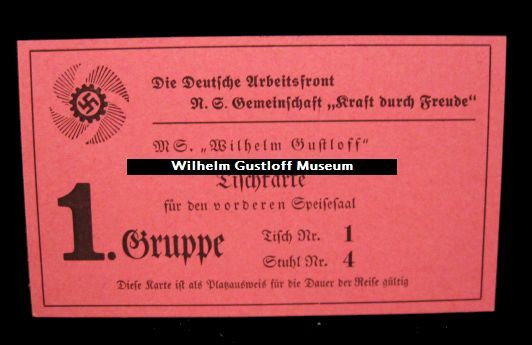 Once held tickets for the trip as well. 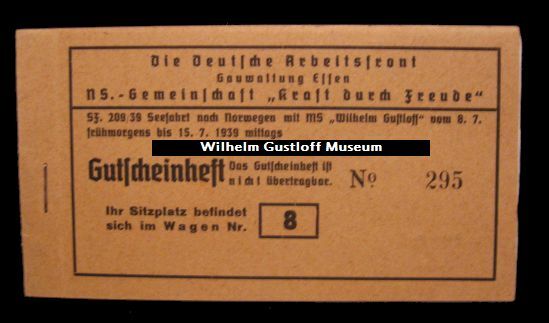 The first 14 photos are from the first ticket booklet. The last 5 photos at right are from the second booklet. 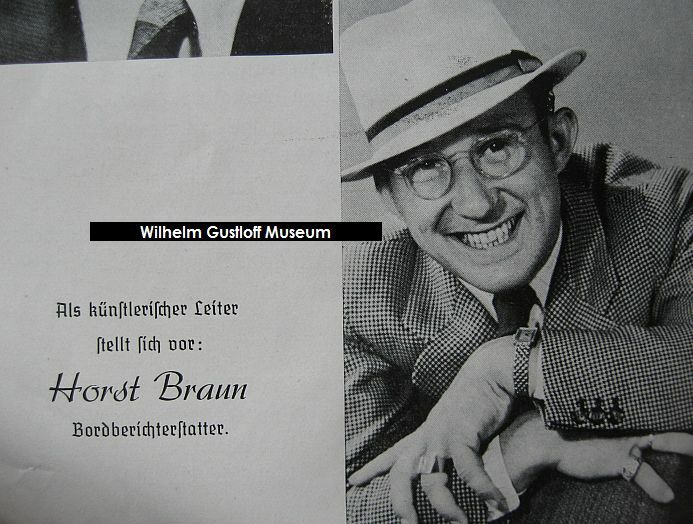 The last seven images are from the brown leather photoalbum of this voyage. 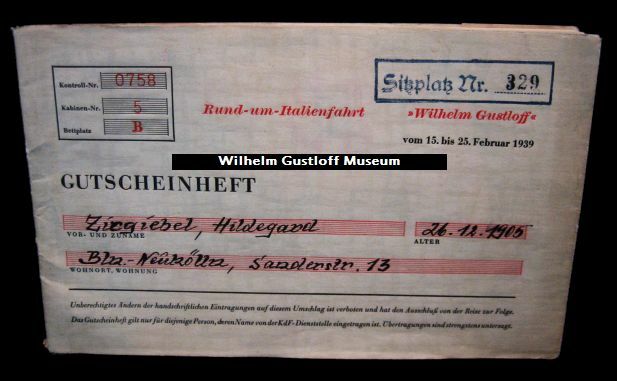 (Gerich & Hildegard Zirgiebel). 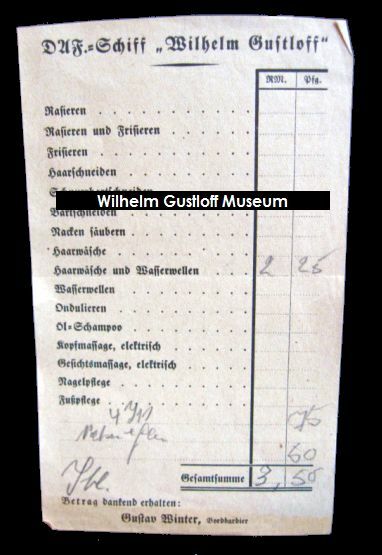 Includes new paperwork including a map of Italy and Attendance List for vacationers at the various stops on the voyage. 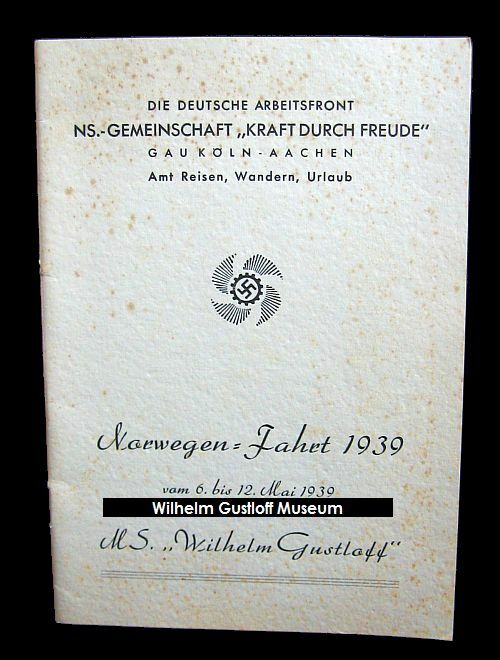 Wilhelm Gustloff Ticket Booklet - Norwegian Cruise & Reichsjugendführung (Reich Youth Leadership) Cruise. 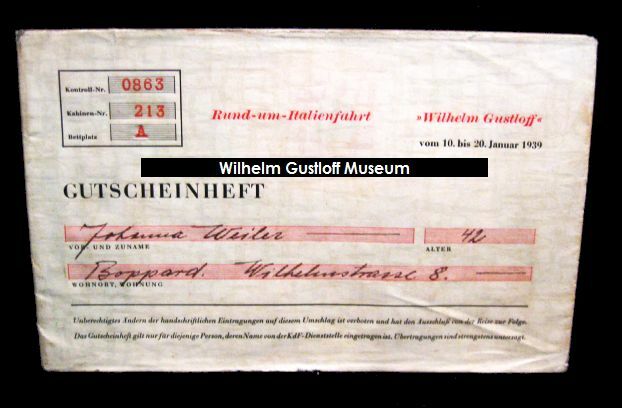 The Reichsjugendführung was one of the few 'alternative' programs that the Wilhelm Gustloff participated in during her career. 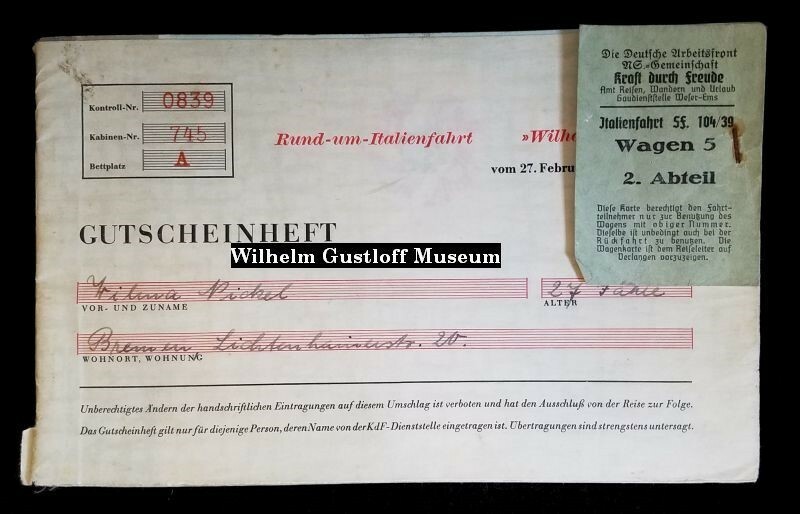 Another Wilhelm Gustloff photo album has this Reich Youth Leadership cruise dated to June 15th and 16th, 1939 from WilhelmGustloff.com. 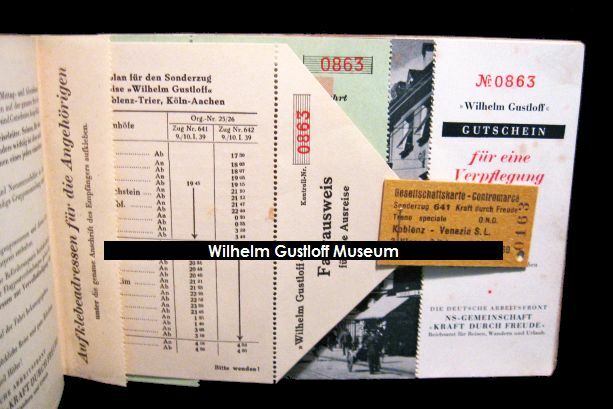 This is the sole site where information of this event comes from, yet with this ticket booklet and the June 16th menu with voyage schedule, nothing is referenced to a specific cruise for the RYL. Was it an unplanned onboard event at the last minute?, or something not worthy to mention? 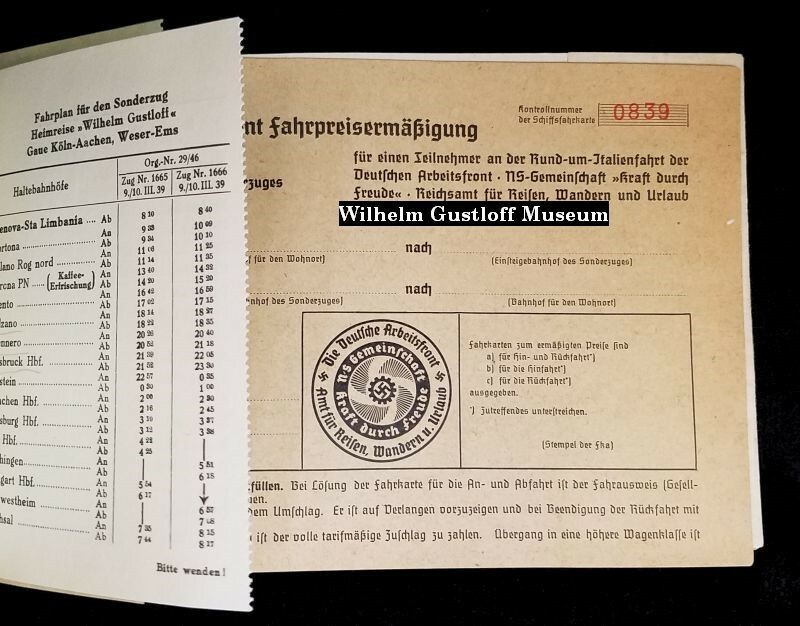 The other album also (apparently on the same page) places her in Swinemünde, or Świnoujście, Poland on the 15th of June, which is false, as she was in Hamburg that day. 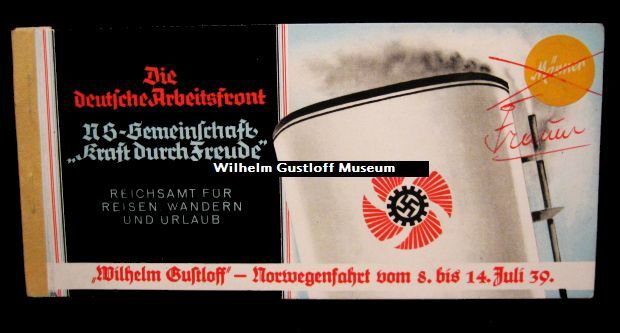 It could have been a stop on the return voyage and is being misunderstood. 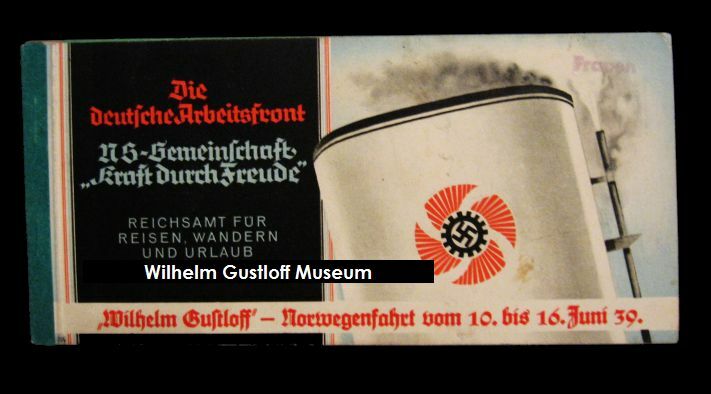 Collection from the white family album under Albums & Photos 3. 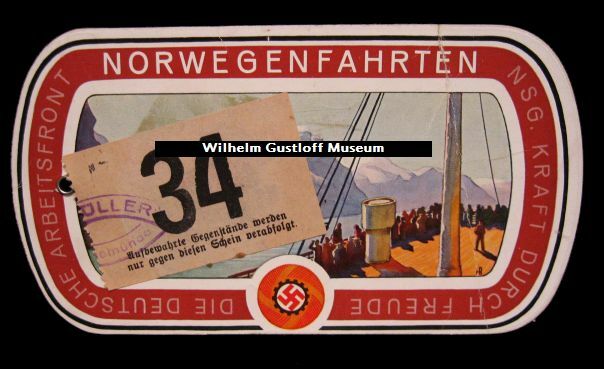 Voyage #40 (Though Listed as 39): June 17th, 1939 - June 23rd, 1939. 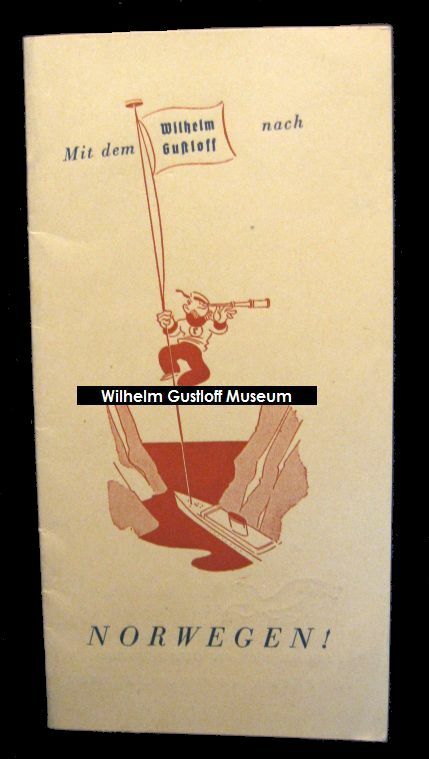 & Fuhrer Booklet with map of Hamburg, Itinerary, and on board newspaper. 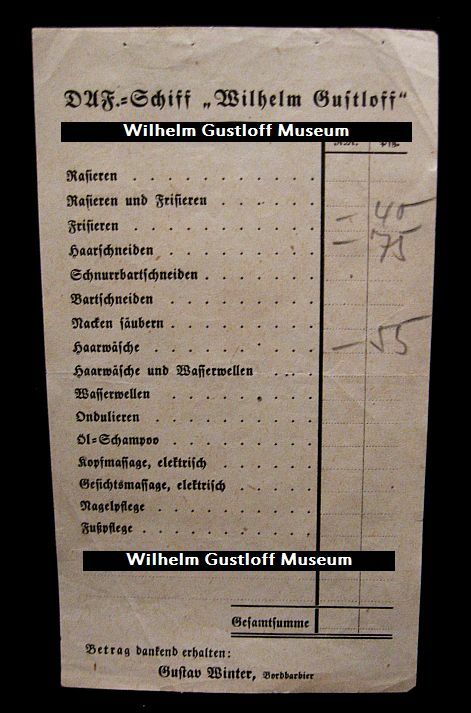 This is the first time I have ever seen a passenger list for the Gustloff. 17 pages of passengers, addresses, and the areas/cities they are from. Purchased from the great nephew of the original owners and passengers on the ship. 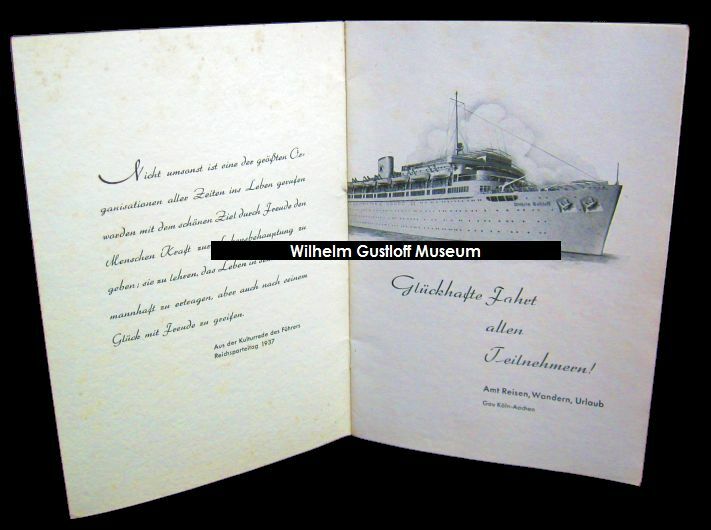 Wilhelm Gustloff Voyage Booklet from Norwegian Cruise. 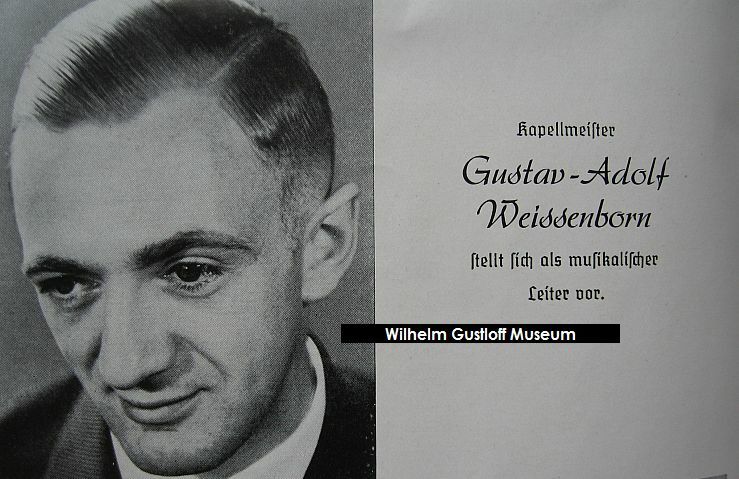 Conductor Gustav-Adolf Weissenborn - Introduces himself as musical director.